The Holy Grail! Owens' model Menger sponge with external support prints a beautiful Level 2 Menger sponge with no internal supports. 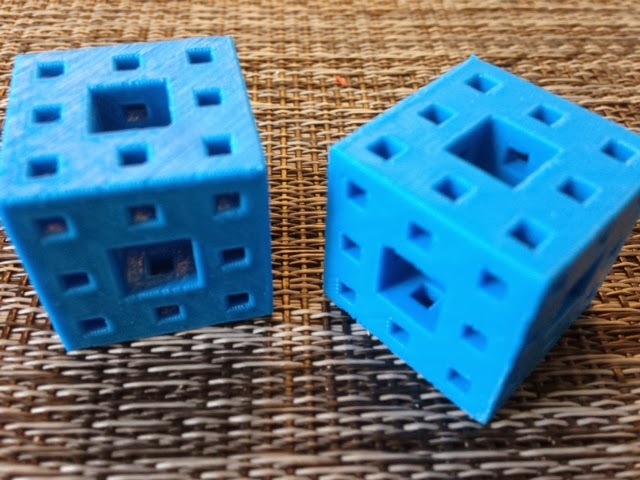 The difficulty with printing a Menger sponge on a filament-deposition printer is that in the horizontal position, the model is stable on the build platform but requires a vast amount of internal support that is nearly impossible to remove. On the other hand, in the diagonal position, the model has holes with 45-degree sides that are easy to print without support, but as a whole is unstable on the platform. In hindsight the solution is obvious, but such is the case with all great ideas. The hard part is to have the idea in the first place! The key to owens' model is a specially constructed ring of external support that is easy to break off after printing. It works beautifully! Settings: MakerWare .2mm/standard on a Replicator 2; each model is at 50% scale and took just under an hour to print. Stuff to change: It would not be difficult to change owens' OpenSCAD code (at the Thingiverse link) to make a Level 3 Menger cube. Or, dare we hope, Level 4? ?